People who visit the Apple App Store or Google Play Store are driven by a similar motivation—to install an app. Once they land on an app store page, the marketing assets they’re exposed to are also similar (i.e., App Icon, App Title, Short Description, Gallery, Ratings & Reviews, etcetera). 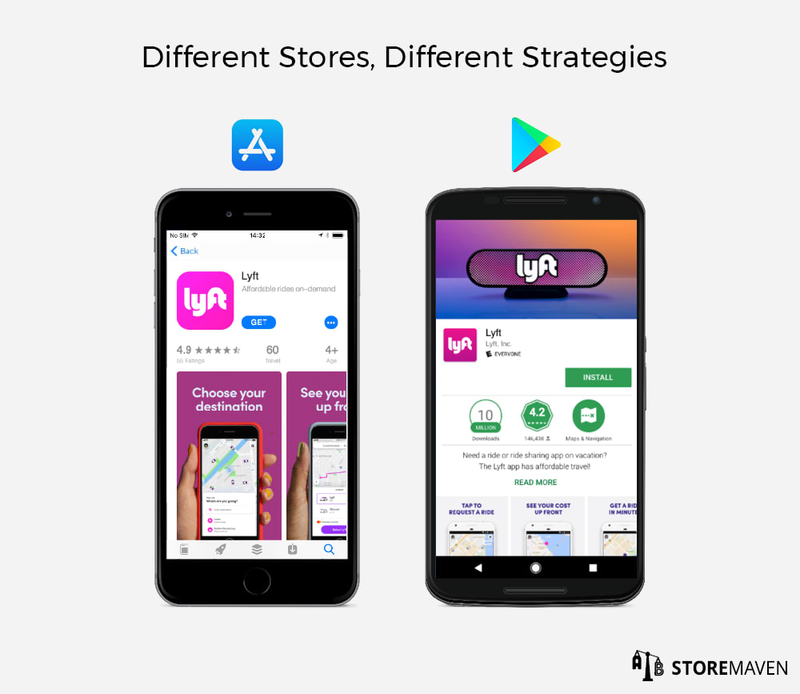 Despite these similarities, the layout of each app store is strikingly different, which greatly impacts how visitors behave and interact with the app store pages. To better understand how each platform impacts visitor engagement, we ran a series of tests that compared Apple App Store Product Pages to Google Play Store Listings. Within each test, all other elements remained the same (i.e., same user acquisition (UA) strategy and app store creatives). Our results, however, varied significantly across platforms, which reveals the importance of using distinct App Store Optimization (ASO) strategies for iOS and Google Play. 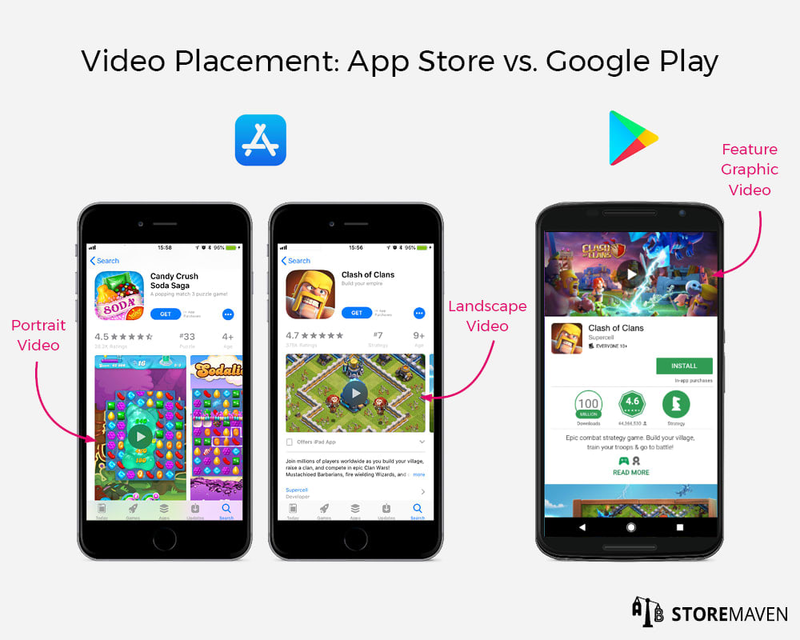 Due to different layouts in the Apple App Store and Google Play, visitor behavior varies across platform and impacts how you should prioritize your asset optimization. Decisive Visitors: visitors who decide to install or leave without ever engaging with the page. These visitors are only exposed to creatives that appear in the First Impression Frame (everything above the fold), and their first and only action is either tapping the install button or leaving the page altogether. On average, Decisive Visitors spend roughly 2–6 seconds on your page before installing or dropping. Exploring Visitors: visitors who choose to browse through available content on an App Store page to make a more informed decision before installing. On average, Exploring Visitors spend roughly 12–35 seconds exploring your page before installing or dropping. 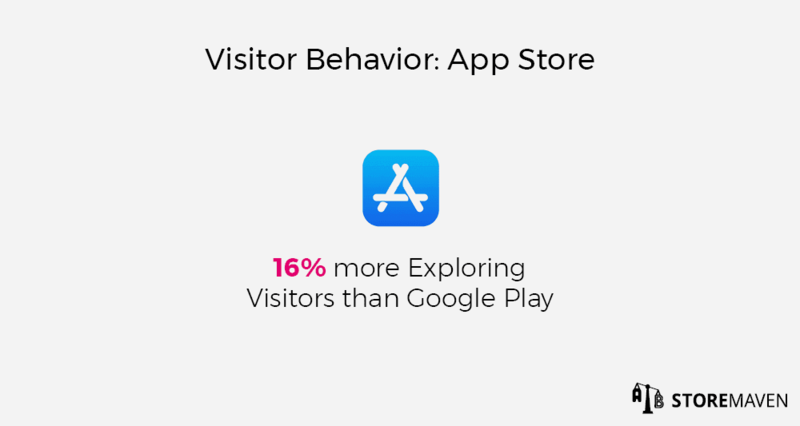 Our data shows that Apple App Store visitors are 16% more likely to be Exploring Visitors compared to Google Play visitors. This comes down to layout. In the iOS App Store, visitors are immediately exposed to the Gallery, which grabs their attention and naturally encourages engagement. The main Exploration Action taken by Exploring Visitors on the App Store is app page scroll (vertically browsing the Product Page to view assets below the fold). To further improve your conversion rate (CVR) and optimize for these Exploring Visitors, you can test different messaging strategies within your Short Description (the first few descriptive lines that appear below the Gallery and above the read “More” button). 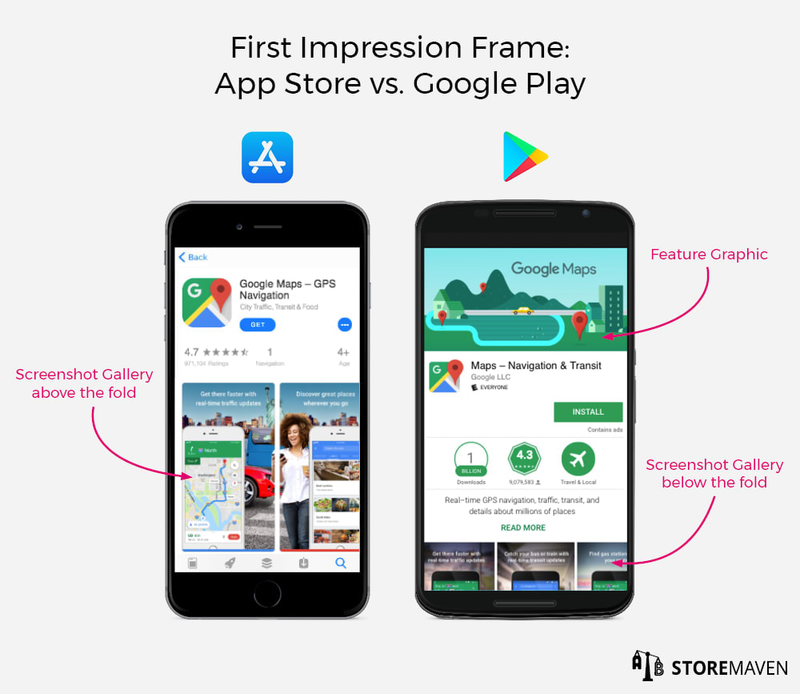 To more effectively appeal to Decisive Visitors and lower their direct drop rate on the App Store, focus on optimizing elements that they see in the First Impression Frame (e.g., App Icon, App Title, Evaluation Panel, and First Impression Gallery). 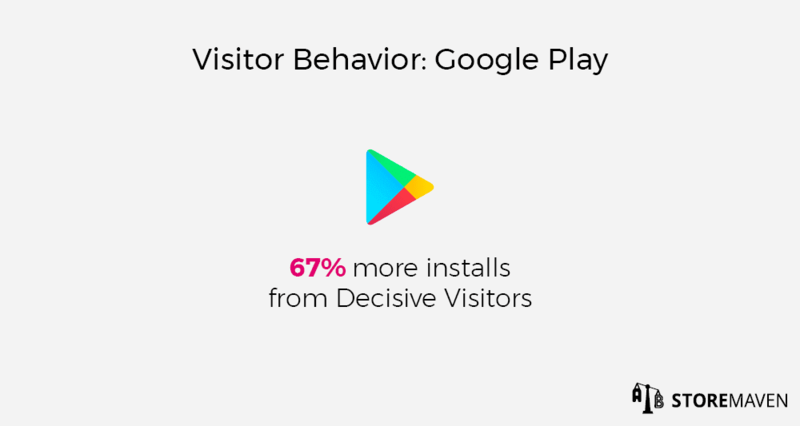 On the other hand, Google Play installs are 67% more likely to come from Decisive Visitors compared to Exploring Visitors*. With a prominent Feature Graphic at the top of the page, and a majority of the Screenshot Gallery below the fold, visitors assume they have a complete visual picture of the app as soon as they land on the page and are not necessarily encouraged to scroll further. One way you can encourage more visitor exploration is by incorporating captions in the top part of your Screenshots that are visible above the fold. Again, it’s essential to test which strategy works best for your app. To improve your CVR and optimize for Decisive Visitors on Google Play, focus on optimizing elements that they see in the First Impression Frame (e.g., Feature Graphic, App Icon, Short Description, etcetera). Note that these marketing assets differ from those in the First Impression Frame on iOS, which brings us to our next major finding. *Google is expected to roll out an App Store Listing redesign. The new layout showcases the Gallery above the fold, which inherently encourages more engagement and exploration than the current design. We ran initial tests on the new design, and our results have shown that the exploration rate actually increased by 83%. Upon landing on an app store page in the Apple App Store or Google Play, visitors are immediately exposed to different marketing assets within the First Impression Frame (everything above the fold). These assets are key drivers not only for CVR, but also for the quality of installs. In fact, our data shows that 50% of installs come from the First Impression alone. In order to increase installs, it’s crucial to use the most dominant marketing assets in the First Impression Frame to showcase your app’s unique selling propositions (USP) and strongest messaging. However, the dominant assets in the First Impression Frame differ significantly across platforms. On the Apple App Store, you should focus on optimizing the Gallery since it is the most dominant marketing asset in the First Impression Frame—and therefore has the most significant influence on CVR (potential CVR lift of 18–40%). The orientation of your Screenshots and Videos also has varying implications on the Gallery and Product Page layout, so it’s important to test which combination of portrait and landscape-oriented Gallery assets most profoundly impacts your CVR. In Google Play, on the other hand, the Gallery is pushed mostly below the fold. For this reason, the Feature Graphic*, located at the top of the store listing, is the most influential creative asset in the First Impression Frame (potential CVR lift of 24-31%). *The new Google Play layout dramatically alters the First Impression Frame by removing the Feature Graphic and bringing the Gallery above the fold. 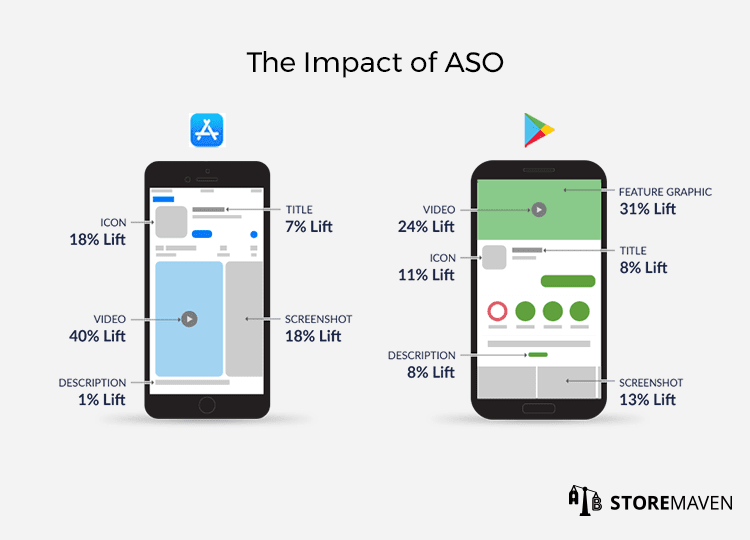 For more information on how the redesign may impact your ASO strategy, read this. Another significant difference we have identified between the Apple App Store and Google Play is Video engagement. In the App Store, App Preview Videos are located in the Gallery and are on autoplay, which means a majority of your Product Page visitors will view them. However, this does not mean that they’re actively engaging with your Videos. Due to autoplay, even Decisive Visitors can passively be exposed to your Video without opening to watch in full screen. Since the average Video watch time among all app categories on iOS is only 4–6.5 seconds and completion rate is below 20%, you should communicate your app’s main value propositions in the first 3 seconds. This will ensure that both Decisive and Exploring Visitors see your app’s key messaging regardless of engagement level. In Google Play, when a store listing includes a Video, a play button overlays the Feature Graphic, and visitors who click to watch are redirected to a YouTube link. This leads to a much lower Video watch rate* (around 4-6%) compared to the App Store. However, these visitors are highly engaged since they made the choice to click and watch. Make sure the Video is effectively tailored to these Exploring Visitors, as we have found that an optimized Video has the potential to increase CVR by up to 24% on Google Play. Testing also gives you insights into what the most compelling elements of your Video are, where visitors drop off, and which seconds push them to install. You can learn more about best practices for creating a Video here. Although engagement varies by platform, it’s just as important to test the impact of a Video in general (i.e., including a Video vs. no Video) on both the App Store and Google Play to learn whether the presence of a Video impacts CVR. *As mentioned previously, the Feature Graphic has been removed entirely in the new Google Play design. For store listings with a Video, the Video will be the first asset in the Gallery. Based on our initial tests, we’ve found that the redesign increases Video watch rate. For this reason, it’s crucial to optimize your Video so you’re prepared when the new layout officially rolls out. The Apple App Store and Google Play are fundamentally different platforms, and they should be treated as such. Developers often drive different traffic to each store (i.e., distinct sources, campaigns, and ad banners). The user base for Google is not the same as the users on iOS—their mindsets and preferences are distinct. Different apps are popular in each platform, which means the competition you face in each store will vary. Due to the significant differences between each store, it’s crucial to avoid a one-size-fits-all approach to your ASO strategy. In fact, our data shows that taking the same creatives that work on Google Play and using them on the App Store can result in a 20%–30% decrease in CVR on the App Store. The data-driven way to avoid this CVR hit is to test on both platforms and implement customized ASO strategies based on the results. If you’d like guidance on developing ASO strategies for the App Store and Google Play or would like to begin testing on both platforms, feel free to reach out to info@storemaven.com.